How to prevent powder coating caking Different resins having different glass transition temperatures , such as epoxy and polyester resin has a glass transition temperature of about 50 degrees Celsius, lightening agent ( 701 ) has a glass transition temperature of about 30 degrees Celsius, the liquid leveling agent in minus degrees Celsius. The larger the amount of material with low glass transition temperature the powder coating formulations contain ,the lower the glass transition temperature will become .Glass transition temperature is measured by a dedicated large equipment, powder coating manufacturers generally do not have this expensive equipment, and in the production process they can not grasp the glass transition temperature of powder , therefore , in the production of the powder system positioned about the glass transition temperature of 40 ° C , the temperature of the powder coating caking as safe temperature . Then in the production ( and product storage and transportation process ) as a standard , close to and above this temperature the relevant personnel must strengthen sampling of product caking .Especially in Summer,the caking problem occurs easily due to the rising temperature, then how to prevent powder coating caking ? First, powder coating at a certain temperature agglomeration is a law of nature. To prevent caking powder coating , production must milling , packaging, storage, transportation, and so the whole process, powder coating products in its glass transition temperature. According to this view is the following solutions: In the polyester resin production , the selection of some of the glass transition temperature can increase the alcohol or acid , or reduce the use of resin, the glass transition temperature to reduce the amount of alcohol to increase the glass transition temperature of the polyester resin . In the powder coating formulation to reduce low glass transition temperature polymer is used in an amount , such as leveling agents and lightening agent to ensure that the powder coating system does not decrease the glass transition temperature . Production, broken down on the strip sheet material should be sufficiently cooled before entering the milling process , milling should be appropriate to reduce the feed rate , increasing the lead air damper , inlet air to control the installation of air conditioning milling temperature . However, if the former mill crushed flakes stuck atop cooling , the latter would not have the means to play a good role , consider crushed flakes on the method of forced cooling cryogenic treatment, which is more effective than retrofitting . Further, anti-caking additives may be added , such as nano- silica (VK-SP15) or nano- aluminum oxide (VK-L20M) powder to prevent adhesion between powder particles , anti-caking agents are generally simultaneously and broken flakes milling best. All in all ,In the production,the relevant personnel must make a strict sampling to avoid powder coating caking . 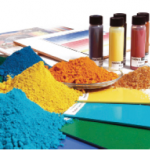 Standard yellow iron oxides are the ideal inorganic pigments to develop a wide range of color shades due to the advantages in performance and cost provided by their high hiding power and opacity, excellent weather, light and chemical fastness, and reduced price. But their use in high-temperature-cured coatings such as coil coating, powder coatings or stoving paints is limited. Why? When yellow iron oxides are submitted to high temperatures, their goethite structure (FeOOH) dehydrates and partially turns into hematite (Fe2O3), which is the crystal structure of red iron oxide. This is why the standard yellow iron oxide that exists before curing becomes darker and browner . This change can take place from temperatures close to 160ºC, depending on the curing time, the binder system and the coating formulation itself.